When many people think Chinese food, they think of sweet and sour chicken, lo mein or fried rice. Yet, these foods don’t actually originate from China. Rather, they are the “Americanized” version of Chinese food with all the grease and cornstarch one could want. Traditional Chinese food is unique in that it differs greatly throughout the country. China consists of 22 provinces and there are many different ethnic groups spanning the regions. So, depending on which area a restaurant owner comes from, he or she may put a different spin on the common national foods, as well as adding different regional dishes to customize their menu. For example, the popular dish scallion pancakes (cong you bing) is a Northern Chinese style dish. The main styles of Chinese food are Cantonese, Szechuan, and Northern Chinese. However, in the United States, most authentic Chinese restaurants generally make food in the Cantonese style of cooking, which is characterized by stir-frying, steaming, and roasting. Cantonese restaurants also have dim sum or what I like to call the tapas of Chinese food. Another popular type of Chinese cuisine is Szechuan style. It has been greatly influenced by foreigners that traveled along the Silk Road. Thus, this style is characterized by strong flavors such as garlic and onions. In Northern China, where the temperatures are much colder during the winter, rice is not a staple. Instead, most people eat wheat or noodles made from wheat flour. With the weather as it is now (glum, gloomy, and wet), one of my favorite dishes to eat is congee. Some people call it rice porridge because it is similar to a thick soup made by boiling rice for a long period of time. It’s often eaten with a Chinese fried bread stick called you tiao. Mixed with the congee, there is often some type of hard-boiled egg and scallions. Many times, I’ve had it with sliced chicken or small pieces of beef. This make congee an ideal dish meant for those cold days or when you’re just not feeling well. Other Chinese soups are generally served family styled. Usually, they’re more of a broth consistency rather than that of a chowder. The soups are often made with some type of soup base or stock, and then expanded upon with different ingredients such as fish or mushrooms. One popular soup is Shark Fin Soup, but it’s mired in controversy due to the way the shark fins, essential to the dish, are obtained. Popular Chinese vegetables include bok choy, Chinese broccoli, mushrooms, bamboo shoots, and Chinese cabbage. The green leafy vegetable dishes such as Chinese broccoli are usually steamed and then stir-fried. Often times, some sort of thick sauce such as oyster sauce will accompany them. Oyster sauce is a very thick black sauce that is very sweet and salty. Other vegetables can also be found simply steamed in soups. In those soups, one can also often times find a dumpling or a wonton. The main difference between the two is the shell. Both are filled with some sort of paste, whether it be meat, vegetable, or seafood. However, wonton shells are yellow because they’re made from eggs whereas dumpling shells are white because they are made from rice. Dumplings are more versatile, as they can be served steamed or pan-fried, whereas wontons are only steamed.Now, my favorite aspect of Chinese food is the dim sum. This glorious style of eating food consists of workers carting around small portions of dishes on carts around restaurants as customers choose which dish they want. These dishes ranges from steamed spare ribs with black bean sauce to shrimp rice noodle crepes. What’s nice is that these portions only cost a few dollars and it’s easy to accumulate a lot of food for a somewhat cheaper price. Also, it’s a great way of being able to have a variety of dishes to accommodate people of differing taste buds. Main dishes in Chinese restaurants differ greatly in style and in what is being cooked. Often times, Chinese food is unfortunately greasy, but it’s still absolutely delicious (from a biased perspective). 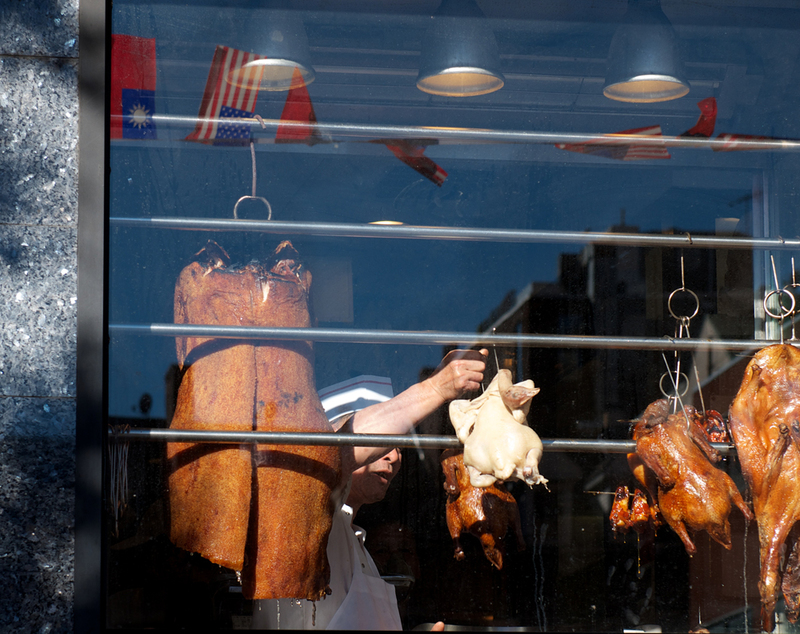 Seafood such as crab, lobster, shrimp, and fish are common, but so, too, are duck, pork, and chicken. However, what’s similar among all of these dishes is that there is always a balance between the amount of meat and vegetables. For dessert, meals are usually finished with fruits such as oranges. At times, one might eat pan-fried water chestnut cake or some type of rice pudding. Desserts in the form of pastries do exist in China. Tea is usually served with these “desserts". The pastries are seen as a cross between eastern and western cultures. There is a type of sponge cake, which comes as a loosely based muffin shape or in a cylindrical shape with a cream filling inside. What is unique about this cake is that it’s fluffier as opposed to having a denser, more cake-like consistency. Another popular dessert is an egg custard tart, which features a tart shell filled with an egg custard.